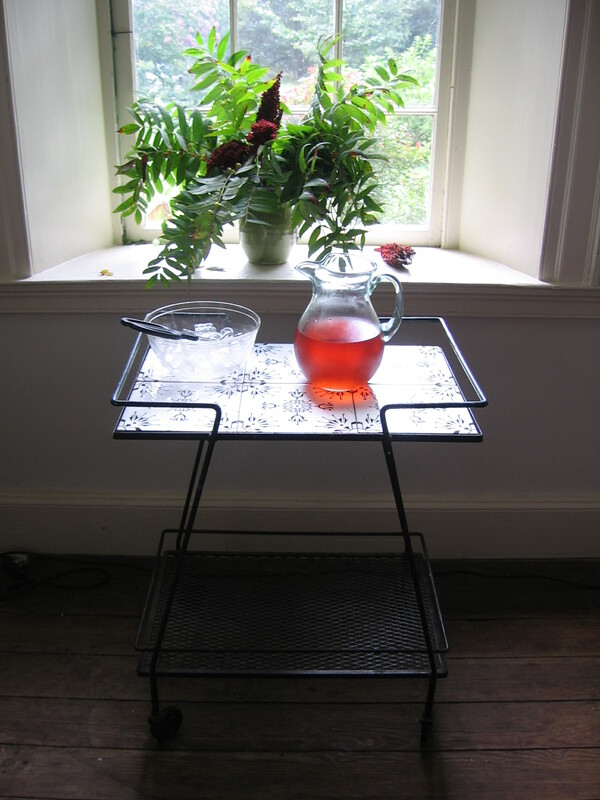 Smooth sumac (Rhus glabra), a refreshing lemonade-substitute. As a common roadside shrub, smooth sumac is easy to identify from its tropical look, having pink, hairless stems, and shiny compound leaves comprised of oval leaflets. The females have red berries rising above their leaves. Once you see the berries, you’ll know it’s not poison sumac, which has white berries drooping below the leaves, and a swampy habitat. Year after year, sumac marks the change of seasons for North American inhabitants: blooming yellowish-white at blackberry-picking time, forming large ruby seedheads during late summer’s harvest, and, when the salmon are spawning in the Pacific Northwest, sumac becomes flames of scarlet leaves in the fall. In the winter, the elongated, pyramidal seedheads stand like darkened torches along roadways. Historically among many American Indian nations, the young shoots of sumac were peeled and eaten raw, and the berries were either chewed as a thirst-quencher, or brewed as a drink. Also, sumac berry, leaf and root were used for life-threatening conditions, such as dysentery, kidney ailments, tuberculosis, and fevers. 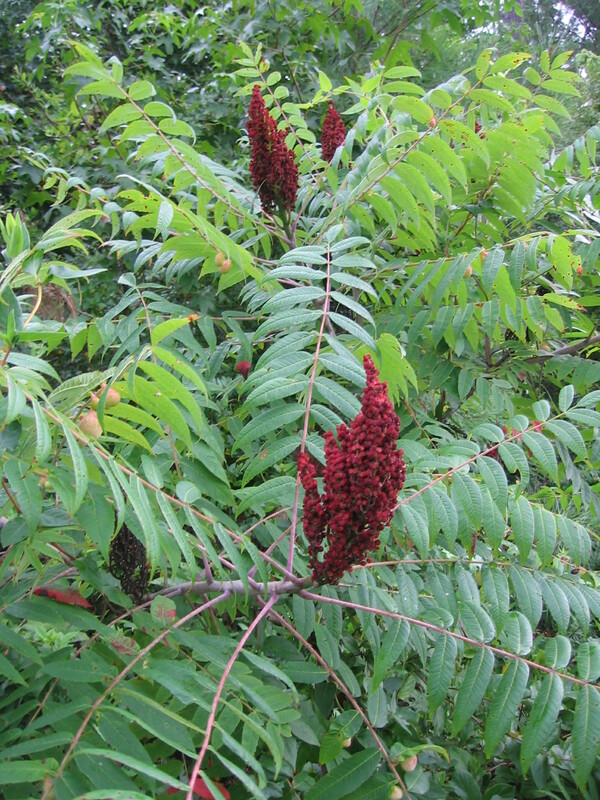 Not only is sumac astringent, but studies show it’s highly antibacterial. Other internal uses were as a blood tonic, or to chew the berries or leaves for sore throats, to stop bed-wetting or as a remedy for vomiting, or to make an infusion from the bark for a mother’s milk to flow more abundantly. Externally sumac was a wash for sore eyes, skin, and itchy scalps. A popular use for sumac among Indian nations was to smoke the leaves. Reddened sumac leaves were harvested in the fall, then de-veined, dried and powdered for either a flavorful additive to tobacco, or a tobacco substitute. Economically, sumac was valued for dyes, leather tanning, and ink among early European Americans and American Indians. Its berries make a dull, red dye, and its roots and inner bark make a yellow and brilliant black dye. Sumac glabra, smooth sumac, in a vase and brewed as a drink in a pitcher for the Brick House Medicinal Plant Walk & Wild Plant Lunch. As a beverage, which looks and tastes like pink lemonade, sumac berries have a cooling, refrigerant quality appreciated on hot days. To make this Americana drink, I grind red sumac berries in a coffee grinder and add them in a large bowl of water, which I place in the fridge overnight. In the morning, I strain the mixture through a coffee filter and either drink as is, or sweeten with local honey. Making a carbon-reducing step closer to self-sufficiency, you can harvest sumac from wild stands, or you can find sumac commercially, and easily grow an ornamental colony in your own yard. 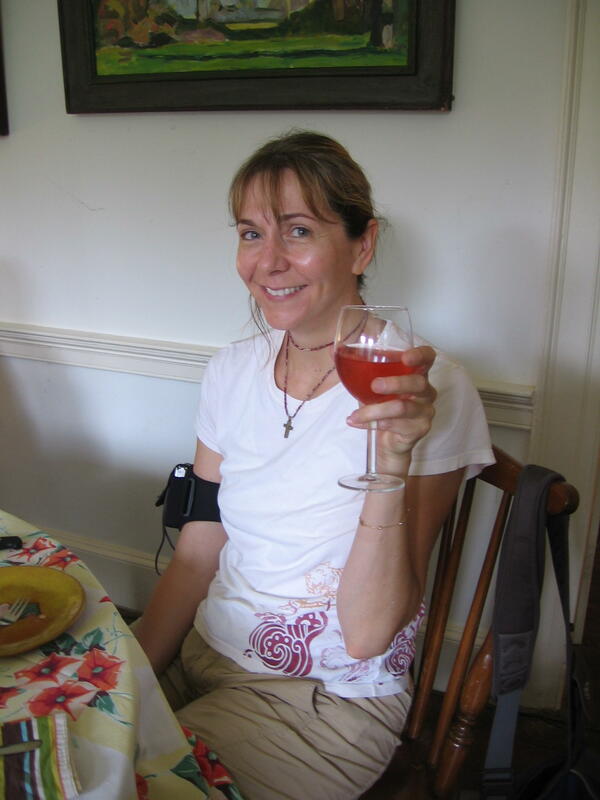 Lifting her glass of sumac-mint "mock"-tail, Joyce from Alpharetta, GA came up for the day to enjoy the medicinal plant walk and the wild foods lunch. Cheers!